CENTER CITY (WPVI) -- Security Perimeters are being established around the Benjamin Franklin Parkway and Independence Mall, where Pope Francis is expected to address large crowds during his visit this weekend. 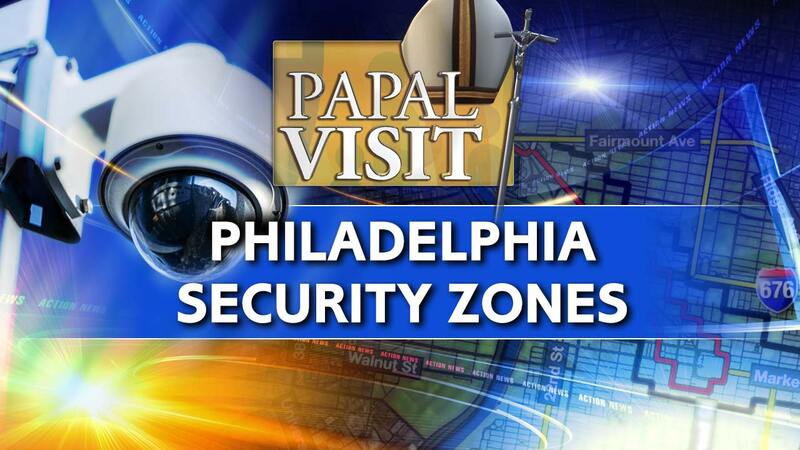 See the security perimeters that will be put in place for the pope's visit to Philadelphia. This is all in addition to the previously announced Traffic Boxes for Center City and West Philadelphia. Pope Francis will be in Philadelphia on Saturday, September 26th and Sunday, September 27th. 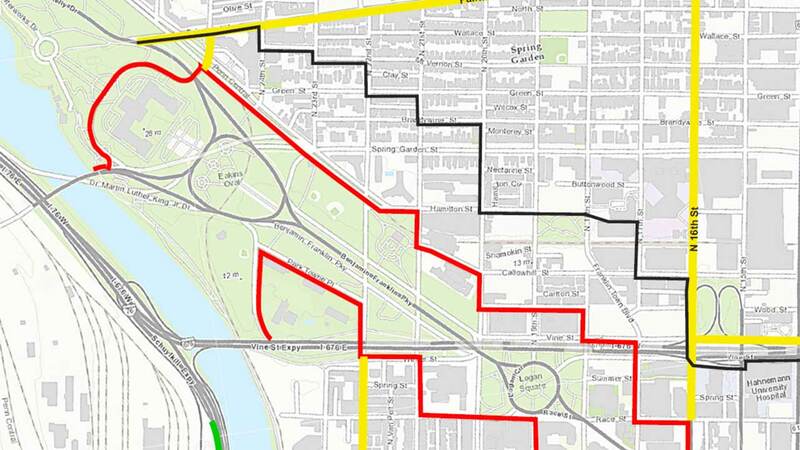 Thursday, September 24th at 10 p.m.: The Security Perimeter and the Secure Vehicle Perimeter around the Ben Franklin Parkway will go into effect and a fence will be constructed. Friday, September 25th at 6 a.m.: Area between 12th Street and west to 20th Street will be open to pedestrians only. In the RED AREA pedestrians will need to be screened with magnetometers. Friday, September 25th at 8 a.m.: Authorized vehicle access roads will go into effect. No other vehicles will be allowed. Friday, September 25th at 6 p.m. in Center City and 10 p.m. in West Philadelphia: The previously announced Traffic Boxes will go into effect. Friday, September 25th at 10 p.m.: The Independence Hall area Security Perimeter and Secure Vehicle Perimeter will be established. Saturday, September 26th at 6 a.m.: 20th Street west to the Art Museum and at Independence Hall - both will be open to screened pedestrians. Saturday afternoon: After Pope Francis' speech at Independence Hall, there will be no screening in that area, but vehicles will still not be allowed in the Security Perimeter and Secure Vehicle Perimeter. Sunday afternoon(Approx. 4 p.m.): Pope Francis will deliver a Mass on the Ben Franklin Parkway. The Secure Perimeters will be in effect through Sunday night. The School District of Philadelphia will be closed from Wednesday, September 23rd through Friday, September 25th. School District of Philadelphia schools and administrative offices will also be closed on Monday, September 28th. This day will be made up during a day previously designated for spring break, March 21, 2016. Meanwhile, Friday, October 9th will be a regular school day to make up for one of the days the district will be closed for the pope's visit. Starting Thursday, September 24th through Monday, September 28th the city will operate on an "essential services only" basis. City employees will be briefed by their supervisors as to their work status for those days. A City Council session scheduled for Thursday, September 24th has been cancelled. Closed from Wednesday, September 23rd and will reopen Tuesday, September 29th. Mayor Nutter announced that starting Monday, August 17th, a Business Resource Center, sponsored by the Commerce Department - with info, maps, a hotline and a Q&A document - will be set up. The city is also working on a plan to allow limited deliveries to occur overnight Saturday into the early morning hours of Sunday, which may include drop off locations - not necessarily direct deliveries to individual businesses. Nutter asked business owners to plan ahead. Taxis will be able to move in and out of the traffic box until 2 a.m. on Saturday morning. The hope is the taxis will help visitors who arrive late by plane or train, even though the traffic boxes go into effect starting at 6 p.m. Friday. Starting at 3 a.m. Monday, the city will have taxi stands in the Traffic Box to provide service to people trying to get to the airport or somewhere else. There will be seven medallion taxi cabs that will be ADA complaint that will operate in the traffic box along with SEPTA CCT vehicles and for ADA scheduled trips.